With less than three weeks to go, I've realised there are a few things I still need to tick off of my blog to do list. 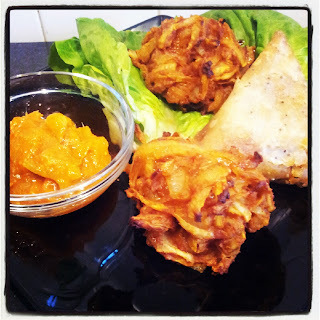 One of those was to make onion bhajis again. I had a disaster with a recipe on day four (I have no idea where the year has gone) and vowed that I'd make them again so, having had this recipe in mind for some weeks, I finally got round to trying it. The good thing about these bhajis is that they are baked and not fried. Although there is oil involved to soften the onions and to give them a 'fried' taste, it's probably not quite as bad as slinging them in the deep fat fryer. Plus there's much less risk of them disintegrating. The mixture is pretty easy to make and, unlike my last attempt, came together and actually looked how I would expect bhaji mix to look. I used two smallish onions - I didn't weigh them - and this produced two bhajis. I'm guessing you'd get 6-8 decent sized ones from the 1lb of onions the recipe suggests. On the down side, I used the full recipe quantity of spices, even though I was only making a fraction of the other ingredients but you couldn't really taste the spicing and I think it would be lost if you had more onions and flour. I'd definitely recommend doubling the spices if you use the full recipe. As for the baked vs fried bit. They were okay, if a little stodgy in the middle. Then again, if you can put up with the grease, things taste so much better when they're deep fried. But we all know that's bad for you so let's not go there. Far happier with this recipe than the last attempt. I think they'd go well with a healthy curry meal if you're looking for that kind of thing. I had them for tea with a random leftover Waitrose samosa which also snuck into the picture, just because that's how I roll on a Thursday night. Sometimes.